We’re really excited to announce that we’re launching our first ever running event on all fours – so you can sprint just like a cat! Ideal for fitness-loving cat lovers, our Mog Jog will take place on Saturday 16 July 2016 (location TBC). We’ll be asking participants to swap their normal sportswear for a fluffy feline onesie or other cat-themed costume and complete a 5k course on their hands and knees or feet – no mean feat! Supporters will also be encouraged to raise money for the thousands of cats that Cats Protection helps every year, while also spreading the message about the growing number of overweight moggies. 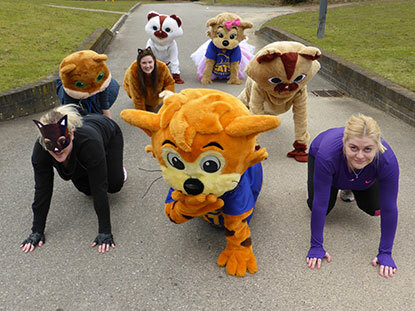 Our Fundraising Events Manager, Rebecca Worth, says: “We have supporters raising money for cat welfare in the London Marathon this month, but wanted to offer another fitness challenge that was a bit silly and lots of fun. “There will be a prize for the first runner who completes the whole circuit on all fours and one for the best cat costume. “We initially planned to make the event a complete marathon but when we realised how difficult it is to move about on all fours we decided to make the course much shorter! We hope the event will also offer an opportunity to raise awareness about feline obesity. Many overweight or obese cats have an increased risk of developing diabetes and can suffer with joint problems such as arthritis. To find out more about preventing feline obesity and keeping cats in top condition, read our Feeding and obesity leaflet.